 All-plastic, professional-grade construction will not rust, chip or peel; resists dents. 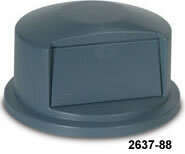  Strong, snap-on lids are available for secure, stable stacking.  Reinforced rims add strength and durability. in complying with HACCP guidelines.  Easy twist on, twist off dolly provides safe mobility.  Certified to NSF Std. #2 (gray, white and yellow only) and Std. #21 (all colors). A wide variety for general and specialty use. 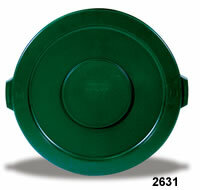  Strong, Snap-On lids provide secure, stable stacking. and standard Standard #21 (all colors). 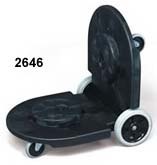  Swivel casters offer better mobility through work areas. 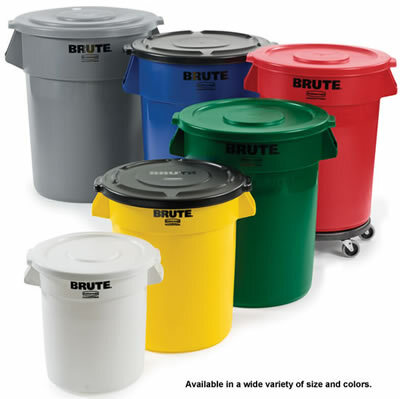  Attach waste containers with easy twist-on/twist-off action. smooth transport of uneven loads.  Precision engineering eliminates 88% of dolly noise.  Non-marking red Quiet Casters. Custom imprinting available; contact us. *NSF Standard 2 Certification applies to gray, white, and yellow only. NSF Standard 21 applies to all colors. 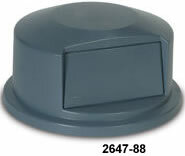 5880-88 can liner for 2643 container and 5011-88 can liner for 2655 containers (Not for sale in California). 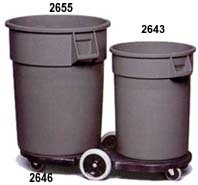 Waste Containers, Waste Receptacles, and Trash Receptacles from your source for material handling equipment.